We pride ourselves in offering personal service and consistent quality. This approach is motivated by the hard work of George Pratt, the founder of Lee Pratt Beef. In 1979, with burgeoning international demand for Australian beef, George along with two university mates, formed a business partnership in cattle processing. George grew up working on farms near the Northern Cooperative Meat Company in Casino, so he returned to the area and began processing at the abattoir. 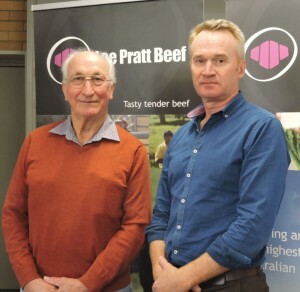 By the mid 1980s, as now sole owner of Lee Pratt Beef, George was a committed processor at NCMC working long days doing many jobs which are now automated or independently undertaken by abattoirs. George developed supply relationships with local farmers who specialised in rearing quality beef cattle, predominately British bred. George’s hard work and attention to detail gave Lee Pratt Beef a reputation for excellence. Domestic and international consumers favoured the beef for a consistently clean, lean and tender eating experience. In the early 2000s Lennard Blok acquired Lee Pratt Beef and continued processing cattle to the exacting standards of the brand. In August 2013, Lennard entered into a joint venture with New England pastoralist Graham Jackson of Jackson Agriculture to become Lee Pratt Agribusiness Pty Ltd. Attention to detail delivers an outstanding product. George Pratt & Lennard Blok, 2016.